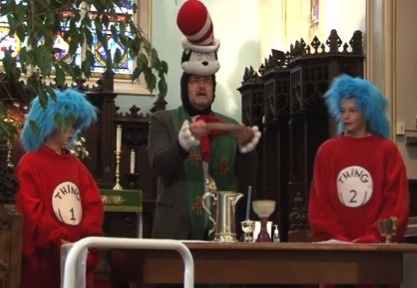 The Living Church has recently carried a story on the celebration of a “Dr Seuss Eucharist” in the Anglican Church of Canada. My understanding is that the particular clip is about three years old but that this worship goes on in other places currently. After getting over my initial facepalm (which nearly knocked me out) I tried to decide what I found so troubling. This unfortunate liturgy has made me think about the Cult of Cuteness and its hold on much of our culture. The faith we are welcoming people to is anything but pretty – it might be beautiful at times but it is hardly defined by our notions of pretty, childish, or delicate. We offer a faith of Cross, Body, and Blood – a faith born in a stable and risen through spear and nails. Our Lord is one who cures with spit and mud. We wash feet and cure lepers. Cute is a thing of antiseptic silliness. It is meant to be endearing rather than to capture the heart – it is of the moment rather than timeless. It strains to have an impact and makes of itself a spectacle to be seen rather than a reality to be known. Cute is the antithesis of beautiful – the beautiful grabs the heart and strains the senses. Cute dulls our sense of the sublime for it rests only on the superficial quirks and charms of the moment rather than challenging our deepest sense of what is made possible by the Holy One. My main problem with this sort of thing is the inversion of the relationship between the worshiper and the worshiped in such services. The liturgy’s chief function is as an act of praise and adoration for God in which we are drawn closer to the one who is sacrificed for us. We are called into deeper union with the Christ made Present in the Gifts. Saint Augustine of Hippo says in Sermon 229 for Easter “there you are, on the table; there you are, in the cup!” He says this not to indicate that the frailty of our humanity is there offered, but that the health and fullness of Christ is being offered – a fullness and health by and through which we are to be utterly transformed and shaped. Services like the Seusscharist take that ancient pattern and upend it such that what is offered on the Altar is some other, cuter, version of us. We take our cultural relics and toss them up there as if they have some power or dignity. The ancient patterns of worship invite us into the petition, prayer, offering, and raising of Christ. Standing at the Altar is the Priest saying for us Christ’s own words – taking his place at the Altar and making known the Presence of Christ. We share in Christ’s prayer calling together upon Our Father. We see him broken and shared for all. I cannot fathom, honestly, where in this divine-human dialogue there is a place for clowns or for the Cat in the Hat or for any other fictionalized representation of cuteness to be interposed. We have enough problems in this culture of worshiping our own creations. The call of the Church is to find a deeper place to dwell with God and to hear the Still Small Voice speaking to us amid the many distractions and even the despair that occupies our hearts and minds. As so often happens we write from the point where our needs meet the Church. From my own point of view, the Church provided a firm foundation when so much else in life seemed to be upturned by loss and grief. I can say, without a shred of exaggeration, that I would not now be a practicing Christian had I returned to the Church to find such a thing as a Seusscharist. It is a rich temptation to theologize one’s preferences but I cannot see the theological justification for worship such as this and find its scant potential pastoral benefits to be drowned by the deep needs of the many lost and searching who find our doors needing the deep and abiding promise of the Church at her most reverent. That reverence can take the form of joyful proclamation, exuberant exultation, or solemn dignity. Yet it must be, as a friend of mine says, “ruthlessly authentic.” True worship bears the marks of a community that has reached into the depths of its being to raise praise to the Almighty. Out of the very heart of its being – deep calling to deep – we allow the essence of the Holy to pull from us our most fervent praise. I am happy for churches to experiment – and boldly so. Yet can we avoid making the faith look cartoonish in the process? Can we strive for true boldness not just cuteness? Can we please, for the love of the Holy, make God the center of our worship and not find one more way to worship ourselves in mawkish costume? Children don’t like cute either. And we do a disservice to them when we “use” them and “make” them cute. I hadn’t seen the article about this “SeussCharist”, but that photo is the stuff of nightmares – and why so many children (and adults) are afraid of clowns. Children are far more open to entering the depths expressed in the Church’s historic celebration of Jesus with us at the table and in our lives than many adults are. Those who work with “emerging adults” or “millennials” or whatever we call them know that this group too finds the truth spoken from the depth of ancient practices – chanting, labyrinths, the Eucharist. It is the counter-cultural message of the faith in Christ that calls to them as well as children. “Relevant” worship always diminishes both Christ and the human being. Woe to us if we offer God our cultural projections as we worship, rather than celebrating that Jesus Christ loves us in our brokenness. It is our privilege to come to the table as we are – not “cute” or “costumed” to hide the brokenness for which Christ died. Splendid commentary that rightly demonstrates the beauty and power of authentic liturgy. Many thanks for continuing your insightful blog.